We are pleased to announce that from the 10th to 14th October 2011, the International North South Media Forum will hold its 27th edition at International Conference Centre Geneva (CICG). Each year the International North South Media Forum brings together experts from the sectors of the media, finance, development and politics. Each edition analyses a topic that holds an important stake for the future. 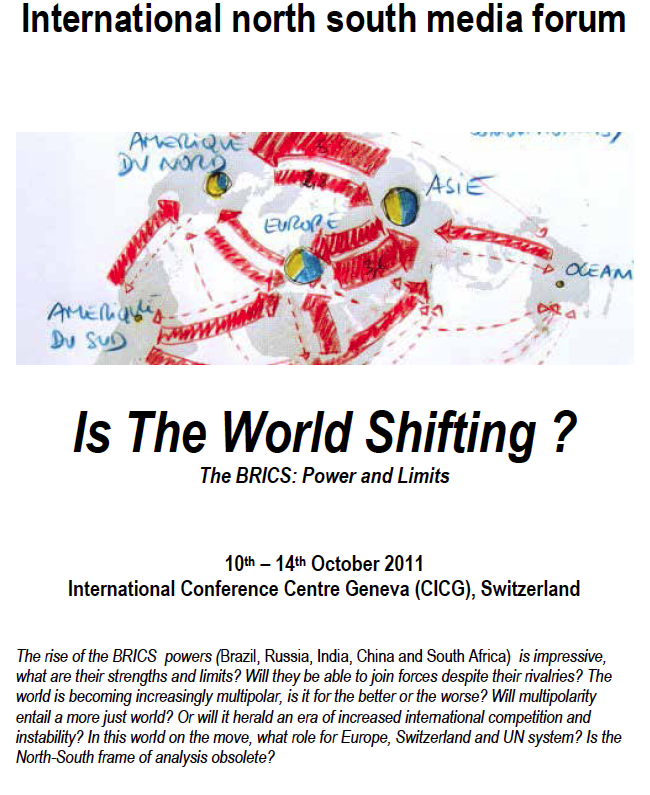 For our 2011 edition we have chosen the theme Is The World Shifting ? 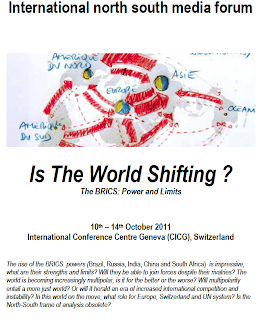 – The BRICS: Power and Limits. 50 documentaries will be pre-selected by professionals and shown to the public, either in the Competition or in the Panorama section. The winner of the international competition will be awarded the "Grand Prix de Genève" (7000 Euros). Exceptionally for its 2011 edition, the INSMF will award a “Prix des 27 ans du FIMNS” (7000 Euros) to the best production in the history of the INSMF. Registration for the competition is now open (find entry form and rules on www.nordsud.ch) and the entry deadline (for televisions and independents) is the 30th of June 2011. Films have to be in relation with this year’s theme and must have been released after the 1st of January 2009. Finally, an ad hoc jury will award the " Prix Mirabaud " to a major written contribution (7000 Euros). The International North South Media Forum of Geneva is mainly organized with the commitment of a number of partners, including: The Swiss French Television, Graduate Institute of International and Development Studies, The Swiss Agency for Development and Cooperation, The International Organization of French-Speaking Countries, the Canton and the City of Geneva, and other foundations interested in creating a platform for international discussions and debates in Geneva. Do not hesitate to contact us should you wish further information.